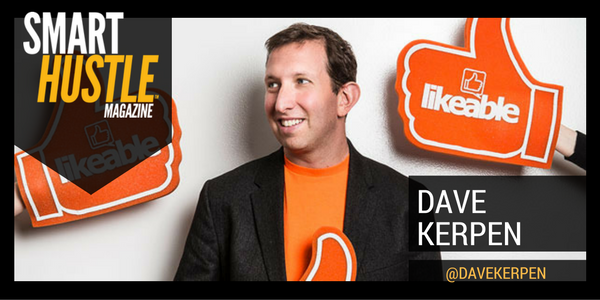 I recently had the chance to catch up with marketing expert Dave Kerpen, CEO of Likeable Local, and author the New York Times bestseller Likeable Social Media: How to Delight Your Customers, Create an Irresistible Brand, and Be Generally Amazing on Facebook (And Other Social Networks). We discussed his most recent book, the evolution of people skills, and the importance of abiding by what he calls ‘The Platinum Rule’ in our everyday business interactions. Clad in his signature orange shoes and trademark smile, Dave talked with me about his modern-day take on How to Win Friends & Influence People and his never-ending pursuit of a more likeable world. Dave’s latest book, The Art of People: 11 Simple People Skills That Will Get You Everything You Want, launched in March 2016 and focuses on what it takes to win success and influence in today’s hyper-competitive world. In other words, put yourself in someone else’s shoes before trying to make a connection or ask for a favor. Dave’s entire brand is centered around becoming “likeable”—and it is not a façade. You can tell that he practices what he preaches, and it is these real-life examples that serve as many of the tips people can use for being more likeable and ultimately get everything they want. How to be more #likeable and become #successful in #business. What is Dave’s secret to success? “I surround myself with people that are a lot smarter than I am.” He asks mentors and other close connections he trusts to meet several times throughout the year on advisory boards to discuss matters related to his companies as well as theirs. Every single person has their own unique strengths. It is up to you to identify those strengths and find ways you can use them to help others, even those that are seemingly more successful than you. Dave has spent a lot of time investing in the company culture at Likeable. With an open atmosphere, a “fun” core value, an anonymous feedback forum, company retreats, and more, the focus is on making sure everyone gets along and enjoys their job. The ability to listen to others, rather than just waiting your turn to talk, was a theme that ran throughout the course of our interview. The importance of listening cannot be overstated. One of the final points Dave left us with is this idea that your mood will affect everything else in your life. So if you can put yourself in a good mood, you will in turn be able to inspire others and help get them in a good mood, too.